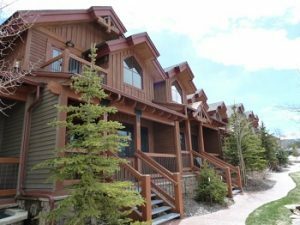 Placer Ridge Townhomes are some of the most appealing townhomes in Breckenridge Real Estate. If you are looking for in town real estate in Breckenridge, this is an ideal location. Located one block from town and a short walk to the base of Peak 9 for skiing, make these some of the best townhomes for sale in Breckenridge CO. Placer Ridge Townhomes were completed in 2004. This relatively small complex is comprised of ten 2 and 3 bedroom properties, ranging from 1,592 to 1,914 square feet. These exceptionally appointed Breckenridge townhomes feature granite countertops, tile and wood flooring, as well as spacious layouts with ample natural light. Breckenridge Ski Area & mountain views to the west are found in the great room/kitchen/dining areas and many Placer Ridge Townhomes feature front and rear decks. Amenities include covered assigned parking, assigned storage and a common hot tub. Perhaps the most attractive aspect of Placer Ridge Townhomes is the convenient location on Ridge Street, just one block east of Main Street, steps from the Breckenridge Brewery & La Cima Mall, within walking distance of the slopes, near the Free Ride bus route for skiing and snowboarding, right in the middle of all of Breckenridge has to offer. This is truly a subdivision of Breckenridge CO Real Estate with a prime location worth seeing in person if you are considering a vacation home in Breckenridge, Colorado.